Imagine your darling baby grows large enough to suddenly resemble a near-teen, old enough to write a book. A real book. A whole 35k of words with a beginning, middle, and end. He’s worked on it for six months, getting up at the crack of dawn to transcribe his scribbled notes to Word before he goes to school. Now imagine that child that you love more than life itself asks you to critique their very first novel. “Do you mean you’d like to have me fix the grammar and stuff?” I ask. “Well, what do you do for other authors?” says Dark Omen. “That’s what I want! I want you to be my editor!” The grin is wide on his face. I am very glad that I have had lots of practice on other authors, strangers and friends who I want to be kind and honest with, before I have to practice this on my own flesh and blood. So I read his book, and I discover that my son is a talented writer, young in craft, with a wicked sense of humor and love of detailed action scenes. I find myself giving suggestions about craft and clarity, just as I would with any other writer-friend. I comment on plot holes and type “Ha!” and “LOL” a lot in the margins. I write a long note at the beginning, praising his hard work, discussing things he can change, and telling him how proud I am. I realize that my son is growing up, which would make me terribly sad, if I wasn’t so pleased that he trusts me enough to share this journey with him. He eagerly awaits my feedback, asking me repeatedly when I think I will be done. “I do,” I say, and I mean it. “Your characters crack me up.” We talk about dialogue and fencing scenes and character names, just like I would with any fellow author. I had no idea the blessings that would come from being a writer. Oh, this is so sweet. My nine year old writes a lot of stories on his laptop and let me tell you, I wouldn't be shocked at all if we see him on the shelves before me. He's got talent:) Congrats on having a child want to follow in your footsteps, and for having one that is close enough to you to share the journey! 3) As you would critique any author? Wish Dark Omen the best! That's awesome. And how great is it that he stuck with it and wrote 35K! No small feat. Good for you for taking your son's work seriously and giving it the respect it deserves. It would have been so much easier to just tell him everything was great, but you are helping him grow. That's what good mothers do. Congrats to your son. What dedication! With an early start and a good coach I expect your offspring to produce something wonderful. Whether or not this first shot will be the one is an expectation to temper, but if the sticktoitiveness is there, success will follow eventually! How awesome. This situation requires a balance of support, praise but also some grown up advice on how to improve and it sounds like you did a beautiful job. @Lindsay Thank you! And it sounds like your day will come, with that nine year old tapping away…! @Mudita I know you understand the difficulty! And I think the fears were all my own. Dark Omen took the critique like a pro. Which makes me glad I gave him the respect of treating him like one. @Bryan Kindergarten! Oh, the cuteness! Make sure you save those early hardcovers!! @LG That's what I told him – that I knew many adult authors who want to write and still haven't finished a book. It's a testament to the boy's determination in all things. @Rick He's actually not too interested in publishing! Maybe he's watched his mom's travails too much. But we agreed we'd get a copy or two bound after he was done with editing. His dad is gung-ho to self-publish online! Which, given Dark Omen's friends have an amazing number of e-readers, isn't a bad idea. p.s. He's already writing the sequel. @Angela That's what I was hoping for! I told him I was proud of how well he took the critique, and that learning that part was part of learning to be a writer. I'm also taking notes for when I teach a class to teens on writing this summer! awww! way to go dark omen!!!! @JB True! And opportunity is like that, isn't it? Frightening and wonderful. I understand the "gulp" part but also the blessing of it! 35k! That is AMAZING! And the bonding you guys are getting over it. I remember sharing my writing with my mom and she really had no clue what to do with it or what to say other than, "I enjoyed it." Your son has a bright future ahead of him. I give him a lot of credit for starting this young. 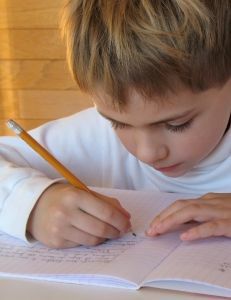 He has a lot of determination to not only write the novel but also to work on it before school. Wow. I'm seriously in awe of him right now. His story sounds like loads of fun! And it sounds like you did what needed to be done to help and encourage him. @Joanna I think Dad may be on to something, too! @Kelly He is a pretty amazing little guy. BIG guy. I have to keep correcting myself! The determination that boy has – he's going to run something some day, I'm sure of it. @Myrna I tried! Sometimes I surprise myself and do alright on the mom-front. See this scares me. My son wrote something and I liked it so much I immediately went into "writer mode" and started making suggestions like I would with a critique group only to look up and hear, "you don't like it." Uh oh. "NO! I LOVE it! That's why I took it so seriously." But I have to reign myself in sometimes. Sigh. @Lisa AND…you totally have to know the kid. Dark Omen is not super-sensitive, but this was his writing, which we all know is a very personal thing. I would have to be super, extra, more-with-kid-gloves careful if this was Mighty Mite, my more sensitive child. Then again, Mighty Mite would probably never ask me to critique. 🙂 I think you're awesome for taking your son seriously! I remember when my youngest son started drawing lots of quirky characters with slogans. I helped him make a compilation of them on Photoshop for a book cover, which he entered into a contest. It was really fun for both of us, and what a kick he got seeing it posted in the Fifth Ave branch of the library. Little kids sometimes have big talent! Awww, I understand where you are coming from. I had to do the same to my son. @Catherine Kids constantly amaze the socks off me. And go you, for encouraging your son's creativity! @LM I know, it's tough! 🙂 But you're an awesome inspiration for him, too! This is both awesome and terrifying. I'm torn between hoping my fiction-inclined children will get a tough skin on their own before asking for my opinion, and wanting to be the one who carefully, CAREFULLY helps them toughen it. Actually, that sounds like how I feel about every aspect of parenting. @Adam Awesome and terrifying is a good description of parenting in general. It's a leap of faith, pretty much the whole way. Susan, that is so so awesome!! I would be so honored if one of my kids wanted to write. How wonderful for you!! I've gone through this with my kids, too. I'm thrilled that they want to write, terrified of the critiques they'll get that are far tougher than mine, hopeful that they'll come through it with their self-esteem intact, their creativity still overflowing. It's tough, this parenting thing, so good for the heart and so wrenching! This is so awesome! A reflection on you as a parent for sure. Great job. What a delightful rush! Clearly, you are a phenomenal role model and an inspiration to your son. I was so touched that I cried when my daughter decided to major in writing at college. PS–Well done! Being honest and fair with your own child is tough work! Oh, yes, I'd love it!